Love cocktails? Love cake? Why not make cocktail cakes? I created this recipe for Pina Colada cakes, and now that I’ve got the base idea I’m thinking of trying it out with other cocktails. 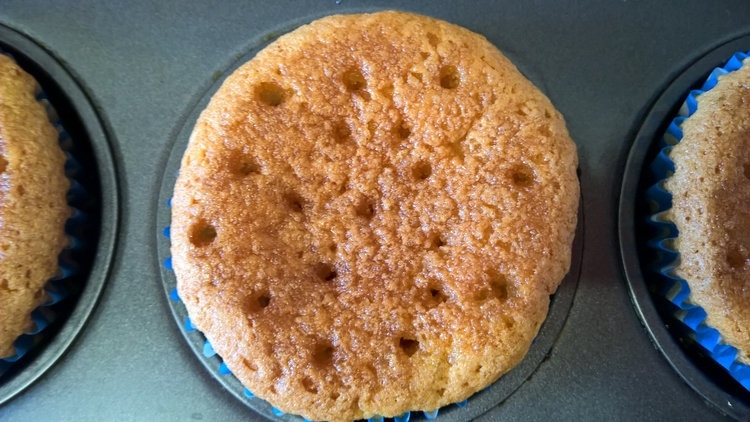 These cakes aren’t difficult, however they are quite time-consuming as there are several stages – they are special occasion cakes though, so it’s worth the effort. You will see that Malibu is used at every stage, so these are definitely not for the kids! Whatever you like! I used some little crispy gold nugget sprinkles and cocktail umbrellas. 1. Put the butter, sugar and Malibu into a skillet and heat until the butter has melted. Swirl or mix it around. Drain the canned pineapple and cut the rings into three or four pieces so that they will more easily fit in the skillet. 2. 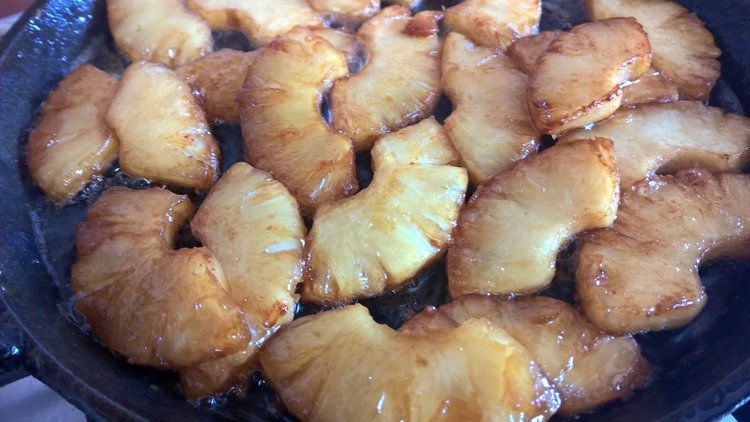 Place the pineapple into the skillet and cook on medium heat until they are golden brown and caramelised. At first it will seem like nothing is happening for quite a while, but once the liquid has evaporated off they will start to take colour, keep an eye and turn the pieces over regularly, they can quickly become too dark. (You could just stop here and serve the hot caramelised pineapple with vanilla ice cream instead – I was tempted!). 3. Remove the pineapple pieces from the skillet, allow to cool a little and then chop them up into roughly raisin sized pieces. 4. Preheat oven to 160C/320F. Line a 12 hole muffin pan with muffin cases. 5. Whisk the sugar and butter together with an electric whisk for up to 5 minutes until pale and fluffy. 6. Add the eggs one at a time beating well in between. 7. Add the flour a couple of tablespoons at a time mixing each time. 8. Mix in the Malibu, pineapple essence, and caramelised pineapple pieces until combined, but don’t over-beat. 9. Divide the mixture into the muffin cases and bake for at least 25 minutes until golden and a skewer inserted into the middle comes out clean (mine took 26 minutes). Leave them in the tin while you make the drizzle. 10. Mix the Malibu and icing sugar together and warm in the microwave for one minute. 11. Using a skewer make lots of holes in the cakes. Using a teaspoon drizzle the Malibu and icing sugar mixture over the cakes, encouraging it into the holes. Leave for 10 minutes and then lift the cakes out of the tin onto a rack and leave to cool. 12. Using an electric mixer, beat the butter with the coconut essence until light and fluffy. 13. Add the icing sugar a little at a time and beat on medium speed in between each addition. 14. Combine the cornstarch with the Malibu, mix well, add it to the frosting along with the desiccated coconut and beat until well combined and light and fluffy. 15. Roughly spread the icing generously on the top of each cup cake, creating peaks. Do you like cocktails? Ever had cocktail inspired cakes? Now I’m all the more disappointed our meet-up in London didn’t work. Think of the awesome treats you could have brought me! Yes. I’ll bring the whipped cream. Oh wait, that sounds wrong somehow. 😀 😀 😀 Is that happy on the inside or happy on the outside? Sounds good. I’ve made rum cake before. I put up some apricot preserves with a generous helping of amaretto. Never thought of a cocktail cake. Well I guess a cocktail cake is just a bit of a gimmick really, but I like having fun with food, and cocktails are tried and tested flavour combinations so why not! It’d probably be good to try one made from a coffee liqueur – a White Russian cupcake? I think it’s a great idea. The whole concept is very creative. 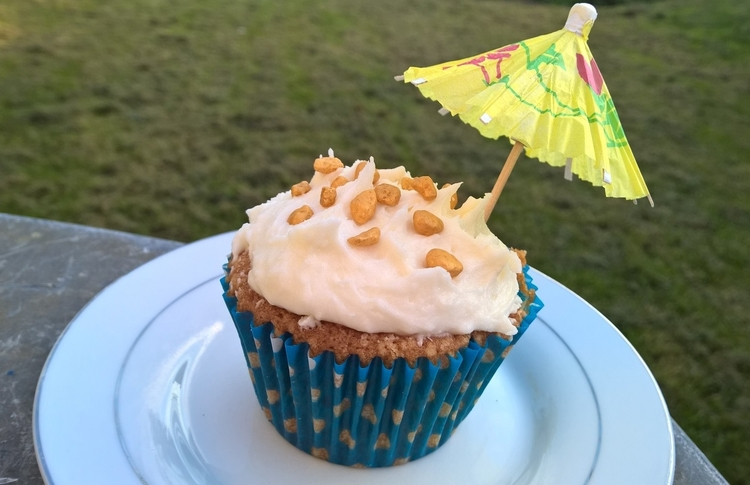 Well after I’d made them, I searched online and found other recipes for Pina Colada cakes, so I can’t claim this as an original idea, but my way of doing them was original at least I think! I think you should still get credit. Simultaneous creation? You had me at pina colada. These look delicious. Can I have a cocktail with mine? Thanks Bulldog, although I don’t really see you as a cocktail type of guy! Vanessa, I’ve said it before, but you should have your own show! Your recipes and personality would soon be fan favorites. 🙂 These sound absolutely heavenly, but I don’t think I have the patience any longer for this level of baking! I would LOVE my own show! I just need the networks to recognise my potential 😉 I surprise myself sometimes with my patience for baking, I never used to have that, I’d always be looking for quick and easy recipes, but now I’m quite willing to set aside big chunks of time at the weekend to indulge in baking – maybe something to do with my kids being older now and not needing my constant attention, I nurture the flour instead! Now all we need is some sun and sand and reggae music and it’s a party! Just realised I missed some past comments, hate it when I do that! Is it too late to party now? Never too late to party, Vanessa!